The Chinese New Year is a celebration lasting fifteen days in January and February and it’s an occasion increasingly celebrated around the world, not just in Asia. Lucky New Year is an online slot machine themed on this festival, it’s developed by Pragmatic Play and it comes with two bonus features and three jackpot prizes. 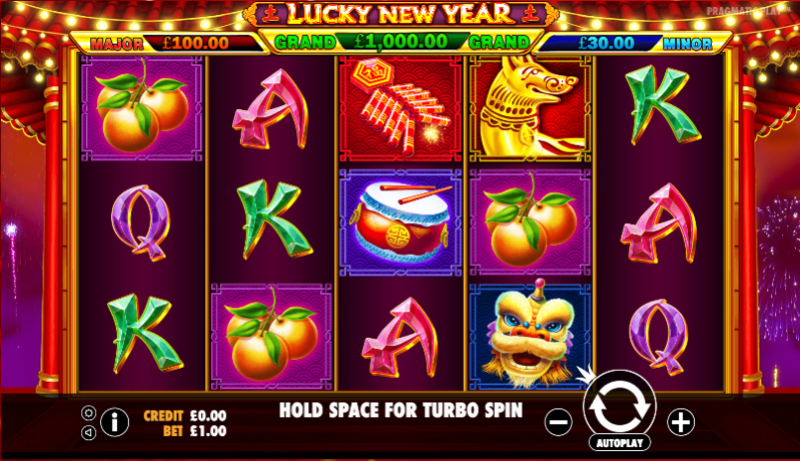 Lucky New Year is a five reel slot with three rows and twenty fixed paylines; the lucky colour of red is dominant here and the reels spin on the side of a traditional Chinese building while fireworks explode in the background and oriental music keeps time. The four higher value symbols are a dragon mask, some firecrackers, a drum and some oranges; J, Q, K and A make up the lower values. The golden dog (2018 is the Year of the Dog in the Chinese calendar) is wild and it will replace all others to help form winning combinations except for the coin and lantern bonus symbols. This is triggered by landing three of the coin scatter symbols anywhere on reels one, three and five; you’ll now receive five free spins which can be retriggered an unlimited number of times with three more scatters. During this round reels two, three and four spin together as one giant symbol which should help out with some decent wins. Trigger this by landing six of the lanterns anywhere in view and you’ll now receive an initial three respins on a set of reels in which only lanterns and blanks are present. Each new lantern which lands will reset the number of spins to three but when no new lanterns land the spins will gradually run out. When the spins have finished the values on each lantern will be totalled and awarded; filling all reel positions with lanterns will award the Grand Jackpot. The Minor and Major jackpots are won during standard gameplay. Lucky New Year is a slot which could certainly be lucky if you can trigger one of the bonus features; the design is similar to other Pragmatic Play games but that’s fine because it looks good and plays smoothly. There’s an RTP of exactly 96.00%.